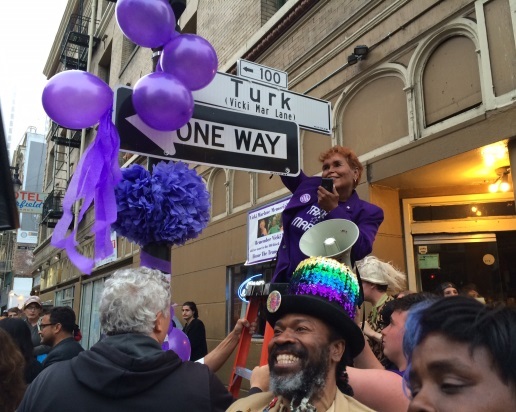 It is the first time in San Francisco history for a street to be named after a transgender icon. Near the end of speeches by representatives and friends, from inside the cable car, Felicia Flame drapes Vicki Marlane’s famous golden sparkling cloak for everyone to see it. 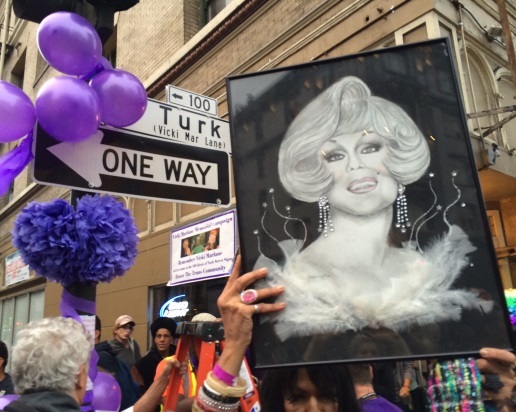 Felicia Flame soon walked across the street to uncover and celebrate the sign. Everyone rejoiced and two people kissed and embraced each other under the new sign and afterwards, pop music played and a space was cleared for people to dance and watch each other dance. It was stunning in an indescribable way that after this celebration, only moments after the event, it seemed that not many knew what had just happened.